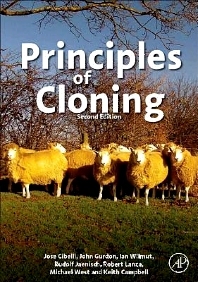 Principles of Cloning, Second Edition is the fully revised edition of the authoritative book on the science of cloning. The book presents the basic biological mechanisms of how cloning works and progresses to discuss current and potential applications in basic biology, agriculture, biotechnology, and medicine. Beginning with the history and theory behind cloning, the book goes on to examine methods of micromanipulation, nuclear transfer, genetic modification, and pregnancy and neonatal care of cloned animals. The cloning of various species—including mice, sheep, cattle, and non-mammals—is considered as well. The Editors have been involved in a number of breakthroughs using cloning technique, including the first demonstration that cloning works in differentiated cells done by the Recipient of the 2012 Nobel Prize for Physiology or Medicine – Dr John Gurdon; the cloning of the first mammal from a somatic cell – Drs Keith Campbell and Ian Wilmut; the demonstration that cloning can reset the biological clock - Drs Michael West and Robert Lanza; the demonstration that a terminally differentiated cell can give rise to a whole new individual – Dr Rudolf Jaenisch and the cloning of the first transgenic bovine from a differentiated cell – Dr Jose Cibelli. The majority of the contributing authors are the principal investigators on each of the animal species cloned to date and are expertly qualified to present the state-of-the-art information in their respective areas. Why is a Monoallelic Expression System of Imprinted Genes from Both Parental Alleles Essential for Mammalian Development? Why do Cloned Embryos Require HDACi Treatment for Better Genomic Reprogramming? Why is Xist Expressed Ectopically in Scnt Pre-Implantation Embryos? Where Are the Genomic Reprogramming Factors? Human Somatic Cell Nuclear Transfer – What is the Difficulty? How do Nuclear Transfer Embryos Control These Processes? Why Does the Donor Cell Mitochondrial DNA Persist? Is There a Relationship between Donor Cell and Recipient Oocyte Mitochondrial DNA that Affects Somatic Cell Nuclear Transfer Outcome? Induced Pluripotent Stem Cells or Nuclear Transfer Embryonic Stem Cells?